Prior to her move to Oregon, Rebecca created and built Southern Ute Alternative Energy, an innovative private equity business focused on no/low impact technologies and business sustainability (ESG) in the cleantech, alternative and renewable energy sectors as President and COO. 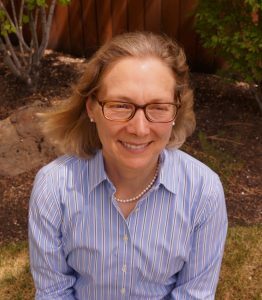 She served on the Colorado Cleantech Industry Association board and the Colorado Advanced Industry Accelerator program which provided funding for young Colorado companies, including cleantech and advanced energy sectors. As an Executive Director in Morgan Stanley’s Institutional Securities Group, Rebecca, held roles in Transformation Services and Strategy and Planning responsible for global expansion of back office operations and establishing enterprise reference data. At Cap Gemini she specialized in operations and supply chain business process improvement with manufacturing clients in pharma, chemical and transportation sectors. Rebecca has a BS in Biology from the University of Oregon and an MS in Environmental Engineering from Stanford University. She is also a certified CISR Practitioner (corporate social responsibility/sustainability) through the Sherpa Sustainability Institute.